"Religions in Russia" Project within the Forum "Petersburg Dialogue"
Within July 22 and 27, 2013, our company participated in the organization of the project ”Religions in Russia” in the framework of the Forum ”Petersburg Dialogue”. The delegations visited Moscow, Kazan, St. Petersburg, Kronstadt, and Valaam. 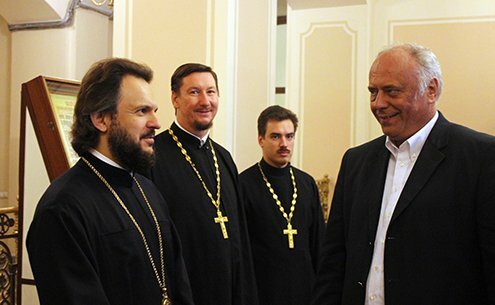 The event saw the holding of meetings with Metropolitan Hilarion, the Chairman of the Synodal Department for Relations between the Church, Society and the Mass Media V.R. Legoyda, Archbishop Ivan Jurkovic, Bishop Amvrosy of Peterhof, and other dignitaries. We provided transportation and ensured accommodation of delegations members throughout the event.